Can the white King move a space to the right, into the original location of the black king? This would be disallowed in standard chess, as one cannot intentionally put themselves into check. However, in rollerball chess, moving the king into this square is supposed to end the game, giving white the win. Thanks in advance! No it is not legal. Just like in normal chess the king cannot move into check, even if it would 'win' the game. 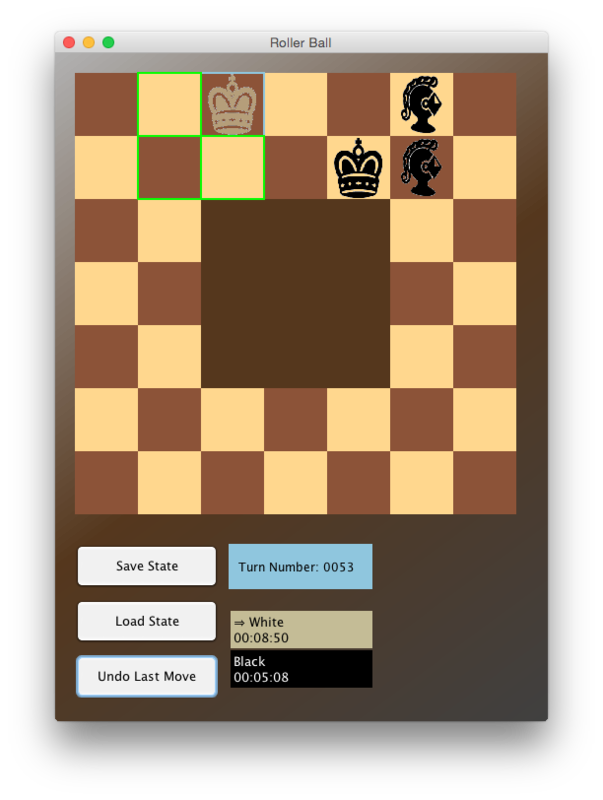 King: moves and captures exactly as in Orthochess to any adjacent square but never to a square where it can be captured. It is the only piece to have a symmetric move. Roi: avance et capture exactement comme le Roi orthodoxe. The French version can be interpreted to mean the same thing as the English version, but can also be interpreted to allow the case of moving to the winning square even when that square is threatened. When the King reaches the starting square of the opposite King, but only if it has turned clockwise. So in the French version you have to complete an entire circuit with your King and it is not explicitly stated that it be clockwise. An anticlockwise (semi-)circuit is certainly very difficult anyway, since your opponent's pieces are much stronger in that direction than your own, so there does not seem to be a pressing need to forbid it. In conclusion I find that the French rules, but not the English, leave open the option of winning by moving to the finishing square even when that square is threatened. I do not see any pressing need within the game to decide one way or the other, so best discuss which house-rule you use at the start of the game. Not the answer you're looking for? Browse other questions tagged chess-variants illegal-move or ask your own question. Are there any legal positions known to be impossible to come to in a normal game?